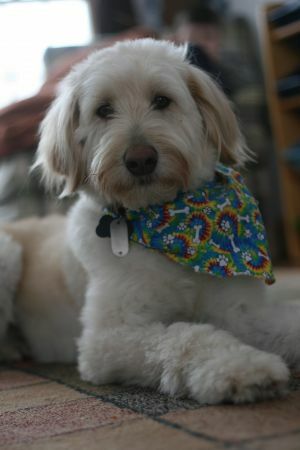 Matty is an adorable Goldendoodle. He is neutered and UTD on shots, and about 35 lbs. Matty has a friendly disposition, is very energetic and loves to go on walks or hikes. He will go rollerblading or biking or on a run with you. He does shed a little, but nothing major. Matty would do best with an ACTIVE FAMILY who will give him PLENTY OFEXERCISE and ATTENTION. A FULLY FENCED YARD. NO or OLDER CHILDREN (over 14 please) as Matty can knock over little ones and has been known to steal food from kids. He prefers to be an only dog and NO CATS as he will chase them. He would love to be the center of your world. Someone willing to work on some training for him would be great, too. If you would like to be considered to adopt Matty, PLEASE FILL OUT AN APPLICATION (Link Below). We cannot answer other inquiries.